I have to confess some shock about the level of interest and excitement with the Star Trek Marisole paper doll on Monday, and then of course, I neglected the blog for a bit. Still, these things happen and I am back now with a wedding dress for Flora. The dress with it’s matching spencer jacket is based on a costume from the Victoria and Albert Museum . I sort of rambled on about the dress in a post I did about spencers and how much I adore them. Do people care about these sorts of random historical fashion things? I never know if I should be straying so far from the topic of paper dolls… I’m still divided about the “posting pictures from my sketchbook” idea. It’s kinda fun, but, again, I’m not sure people enjoy them. Well loyal fans, what do you think? Oh, and I spent some time tonight fixing some link problems some of the Magnetic Paper Doll images were having. If you like magnetic paper dolls, you can check out my directions and images on my Magnetic Paper Dolls page. More magnetic clothing sets will be forthcoming as I get them ready. 1. Archery was actually a common sport among upper class women in the early 19 century. Along with riding, it was one of the few athletic activities women were allowed to do. Flora’s archery dress is based on one from the Manchester City Galleries. 3. There are more people interested in a colored version of 2.0 Curves, then a black and white shadowed version, but the shadowed people are much more vocal… Hmm… Who should I listen to? Maybe I’ll outline it and try it both ways… My concern with shadowed has to do with what I feel like is a loss of detail due to the shading… I need to give it more thought, obviously. Speaking of the Curves 2.0 epic adventure, I hope to have the new series up sometime before the end of the month. I don’t like starting a new series without at least a few posts drawn and prepped. It means I’m not struggling with keeping it going. That’s all the news for now. Enjoy Flora’s Archery and Evening Dresses. So, confession time- I am getting a little sick of the regency period. I think I’ll be spending some time over the next few days doing research and thinking about ending the series. Can I kill two series in like three weeks… is that allowed? I’m just not excited by Flora much right now… Plus she has like 30 costumes which seems a pretty good number…. Though that might just be fishing for an excuse. I shall have to give it more thought. 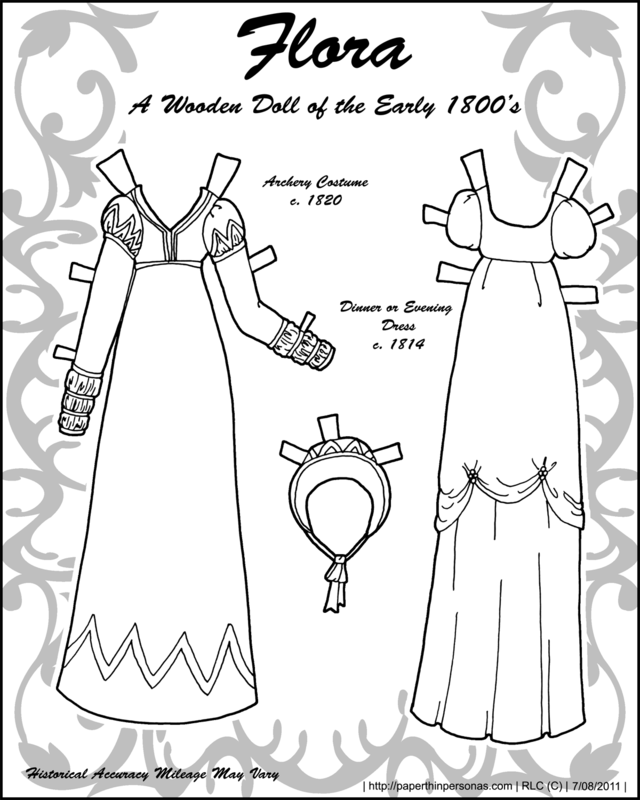 In the mean time, feel free to color and cut out these pretty regency dresses for Flora and, while you’re at it, vote in my current poll. So far I am shocked at the show of support my heavily shadowed paper dolls have gotten. I always thought of them as the black sheep of the blog (and I have the frustration with them that the shadows obscure details, especially on faces), but they’re getting lots of support, though color is winning at the moment. I rather thought it would. I usually try to do a lot of research before I draw for Flora, but I wasn’t up for the work today, so I just sort of tossed together these dresses. I’m not sure I should admit that… hmm…. 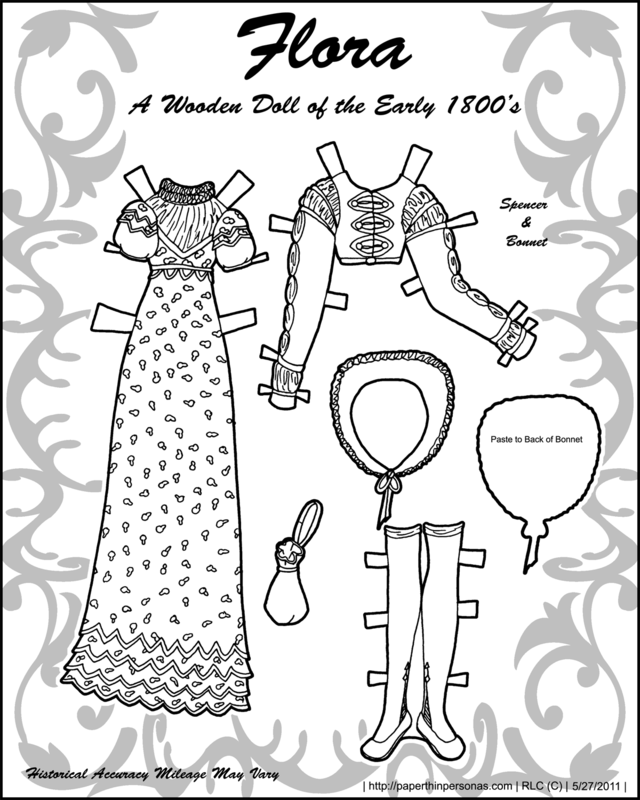 For even more black and white paper dolls, I would recommend a new (well, old blog, but new to me) blog I found. 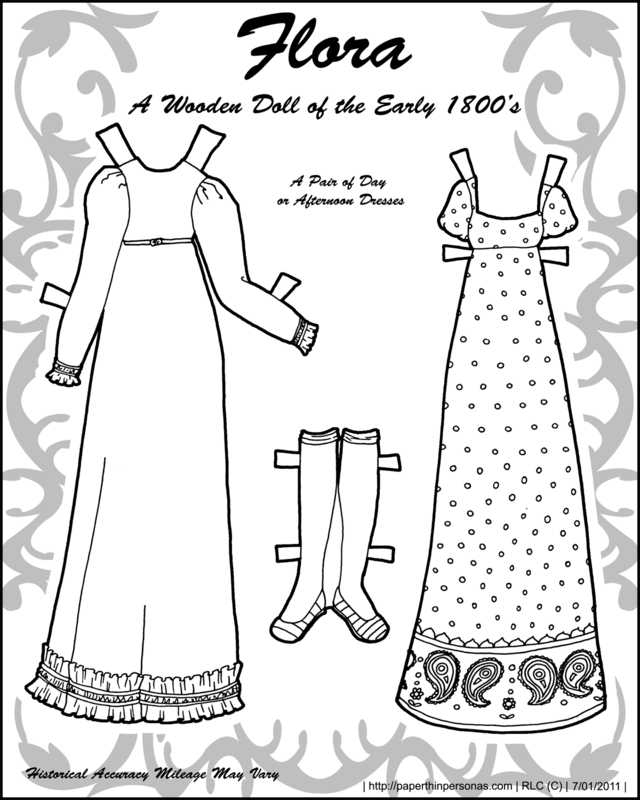 Mostly Paper Dolls is a blog devoted to, in fact, mostly paper dolls (and some coloring pages and other things thrown in for good measure). Some of them are beautifully colored by hand, but most are black and white images from old newspaper microfilm. I really like this set from 1922, particularly the girl paper doll with the very period dresses. 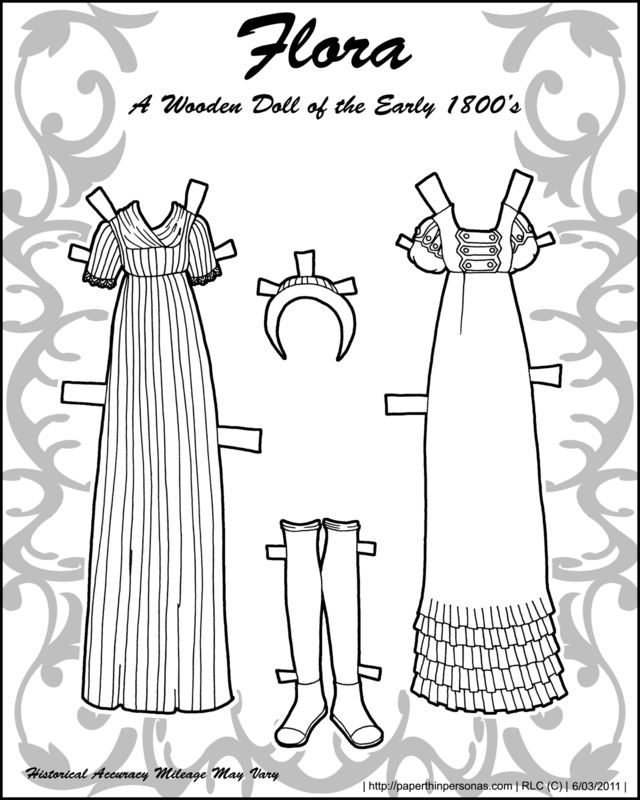 Perhaps I will color it myself someday… Anyway, if you have a few minutes and you feel like pouring through many pages of black and white paper dolls, I recommend Mostly Paper Dolls highly. The image quality suffers (mircofilm reproduction is usually shoddy, I’m afraid), but the quantity and wonderful variety more then makes up for it. 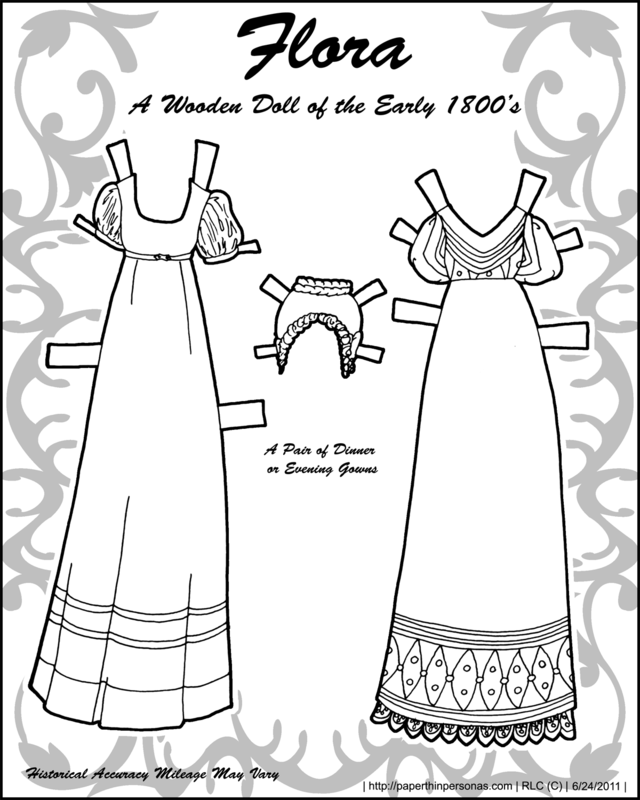 There is a myth that women gave up corsets in the early 1800’s and that’s just not true. A corset, or stays if you prefer, provides a fair bit of support for women, just like a modern bra. They did, however, alter the look of their undergarments. 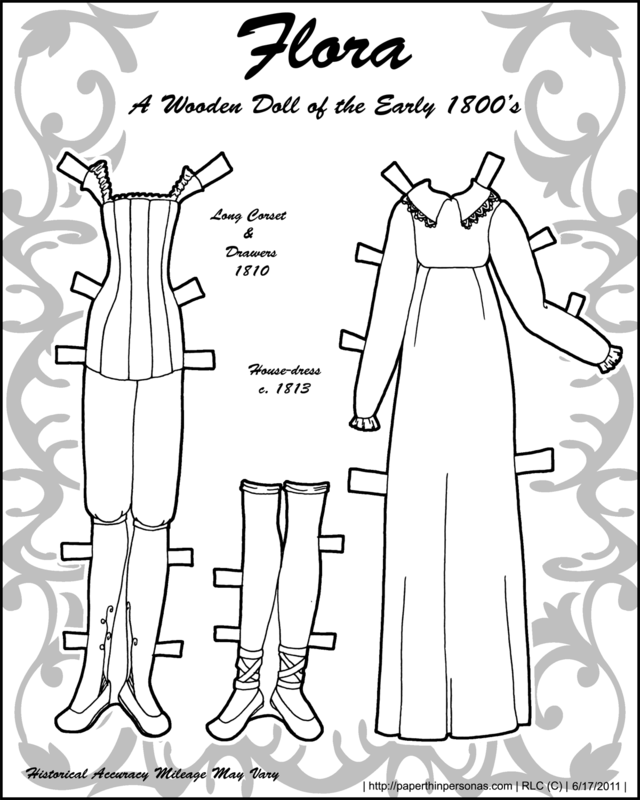 The long corset on the left is from about 1810, though I have seen similar things cited with later dates. I’m afraid I don’t know enough about women’s underwear in the early 1800’s to be sure. Flora’s other dress is a basic house dress- something worn for work as much as anything else. I based it off of this dress though I simplified the skirt. I’d like to draw a few shawls, since they were such a standard garment of the day, but I haven’t decided how to do them yet. It’s nearly Saturday and I am quite wiped out. I went out for drinks with some people after work and then came home and did a bit of cleaning. It was fun, but also tiring after a long intense week of work. This weekend I’ll be taking it easy and hopefully getting some more paper dolling done. It’s humid and hot here- so hot I can feel it on my skin. I very much dislike the heat and would take a rainstorm over this any day. I am not at my most coherent today, so I offer up these dresses and a reminder that I have a poll in the sidebar. That is all. I am crawling into bed now. The spenser is based on a fashion plate from 1819. 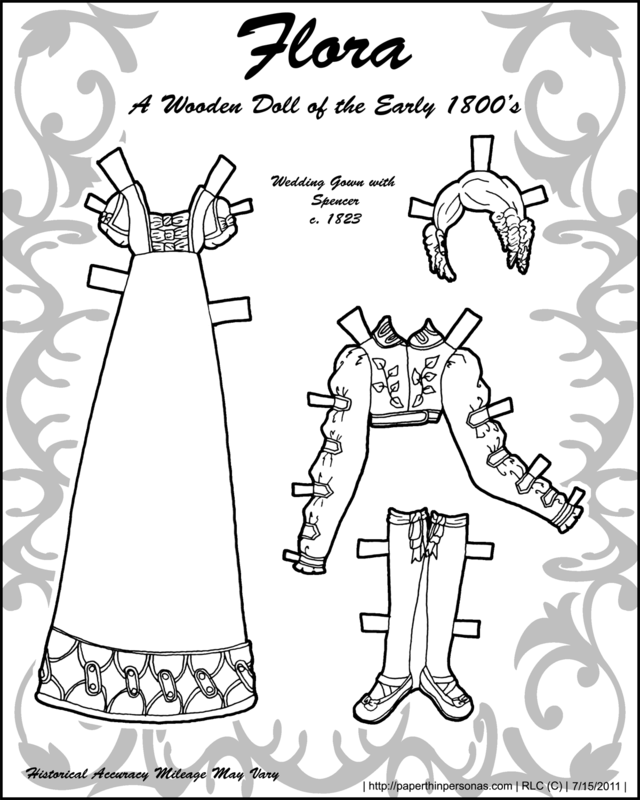 The dress is based on a different fashion plate from 1811. I totally loved the sleeves and knew I wanted to draw it. The bonnet needs to have the back piece pasted on around the edges so that it can slip over the dolls head. For another sort of paper fashions, check out Pulp Fashion: The Art of Isabelle de Borchgrave, a show organized by the Fine Arts Museums of San Francisco featuring fantastic costumes made from paper. The word “astonishing” comes to mind when describing them.